Posted November 6, 2015 by Ralph & filed under Music, Studio. The first bit of building for the acoustic treatment of Blueleaf Studio commences. I’ve started instilling the bass traps first as the low frequencies are usually the hardest to tame in any room, and are also the most crucial when it comes to mixing. You can read plenty of articles on bass traps on the internet like this one. 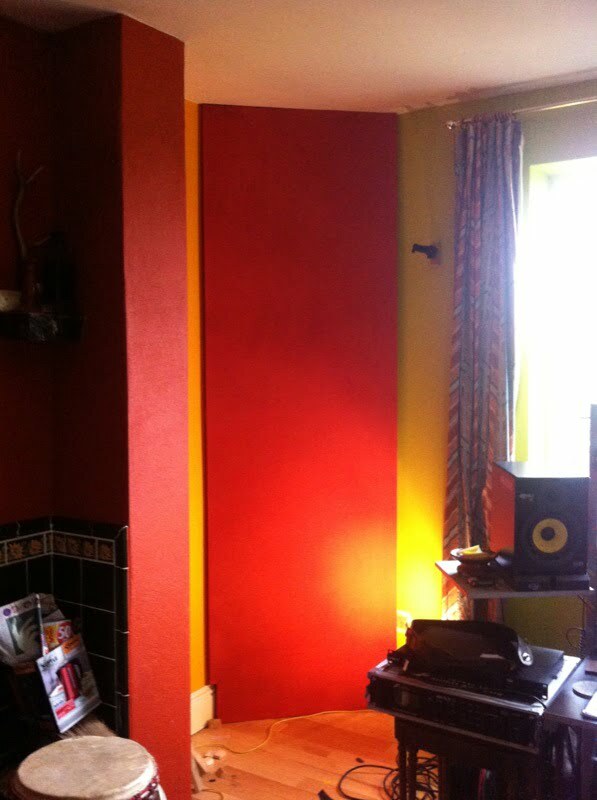 I got shed loads of information from the acoustic and studio building forum over at gearslutz and from John Sayers Recording Studio Design Forum so check them out if you need advice. 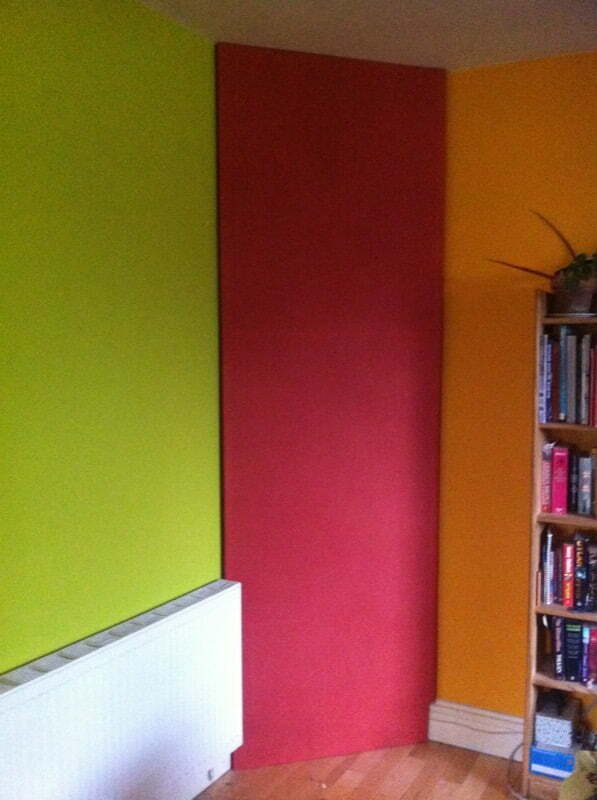 The first corners I decided to tackle were the “power corners” going from floor to ceiling where two walls meet. This ought to have the biggest impact on the modal resonances in my room. 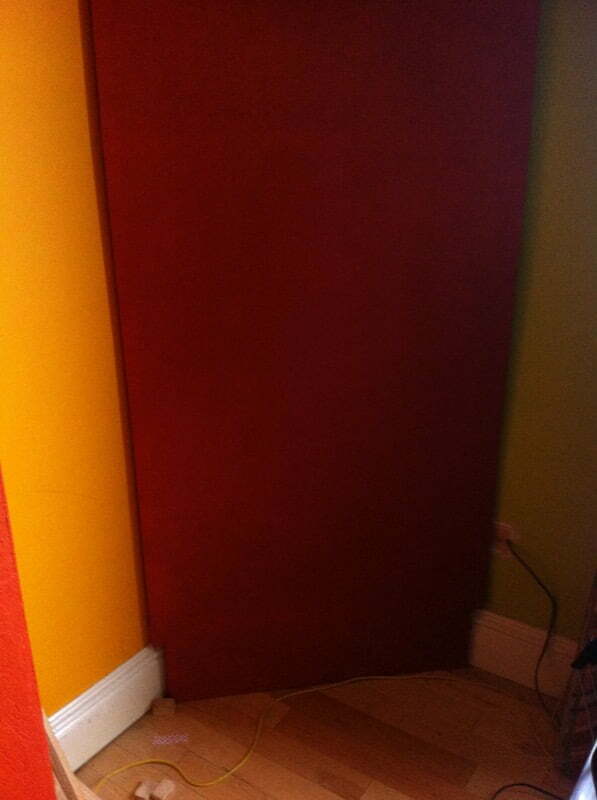 Space restrictions meant that I couldn’t build the absorbers any bigger than about 60cm along each wall and I only had two corners in which I can place traps due to the layout of the room and doors. Still this ought to be an improvement and should help with the nasty room modes between 75 and 120 hz as well as providing some absorption for higher frequencies. To maximise the absorption I decided to fill the corners with insulation rather than straddling the corner with a panel. Although this will only make a small difference relatively, every bit helps as I only had two floor-ceiling corners available to treat. 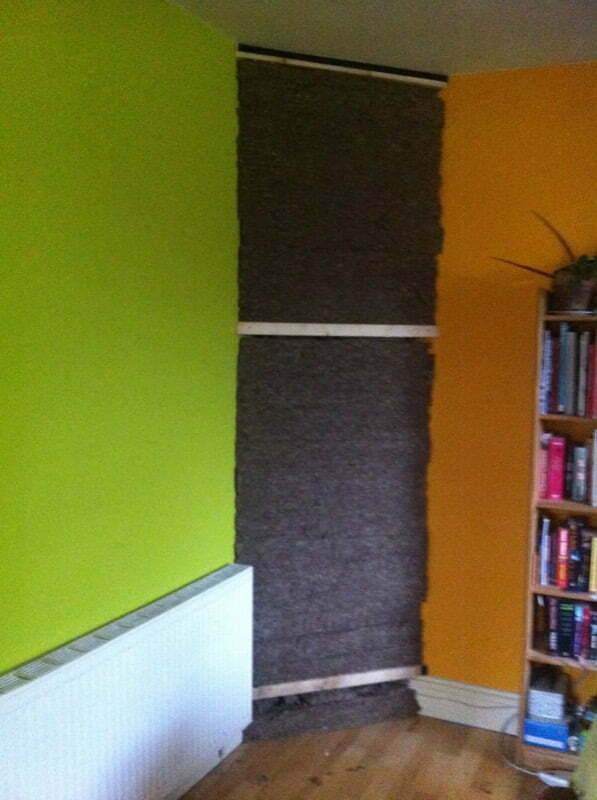 I decided to use Knauf Earthwool RS60 over rock wool RW3 (now called Pro Rox SL930). Both have the same density of 60kg/m3 . 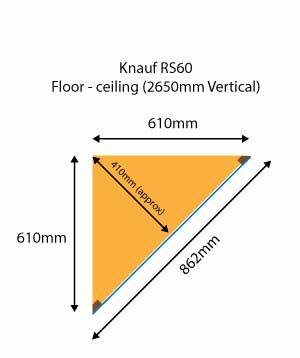 Formaldehyde and other environmentally damaging processes are still used in the manufacture of the Pro Rox SL930 so I went with Knauf who use a formaldehyde free method they call “Ecose” Technology. The stuff is less itchy and dangerous to work with and the potential health hazard is smaller once it’s installed as formaldehyde is know human carcinogen. The insulation slabs are 120cm x 60cm so my measurements made it easy to cut and install the insulation. I decided to use 100% cotton for the front-facing panels. I bought white cotton and some Dylon machine dye to match the colour to the colour of our fireplace. Set an setting are everything so lets not forget the niceties. Having decided on my materials I drew up some quick plans to work out what wood I’d need to buy before drilling into the walls. With my plans coming together I purchased reclaimed wood from Newcastle Wood Recycling Yard. Much better for the environment than buying new form Wickes or BnQ! I used a hand miter saw to cut my 45degree angles and placed three triangular constructions in each corner. One against the ceiling, one half way up the wall and another resting just above the skirting board. As with any building work there was the unforeseen problem. I’d failed to take the skirting board into account in my plans as well as plug socket that clashed with where the front-panel of the absorber needed to go. For the plug socket i purchased a back box or “Pattress” then attached the socket to that using some spare electrical cable and covered the hole with a piece of ply wood. A bit of polyfiller and a lick of paint later and all you can see is a wire coming out of the wall. 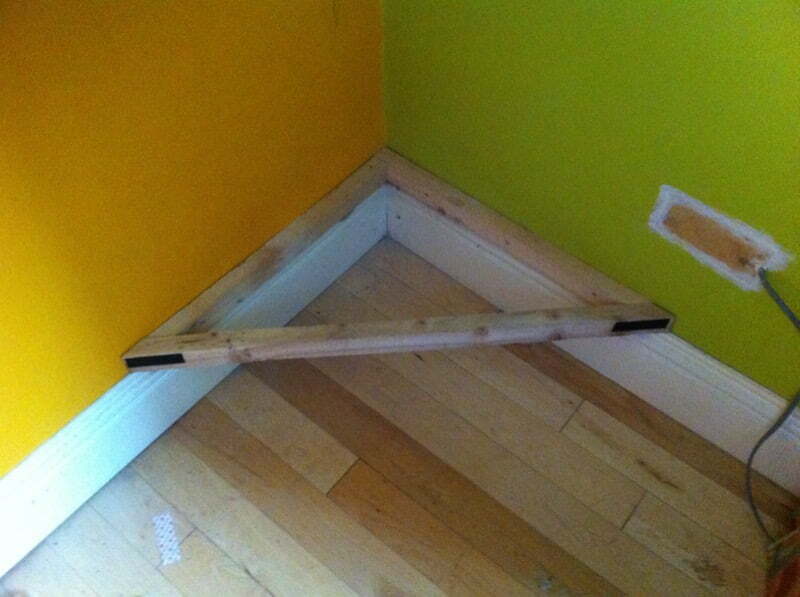 The skirting board is harder to get around. 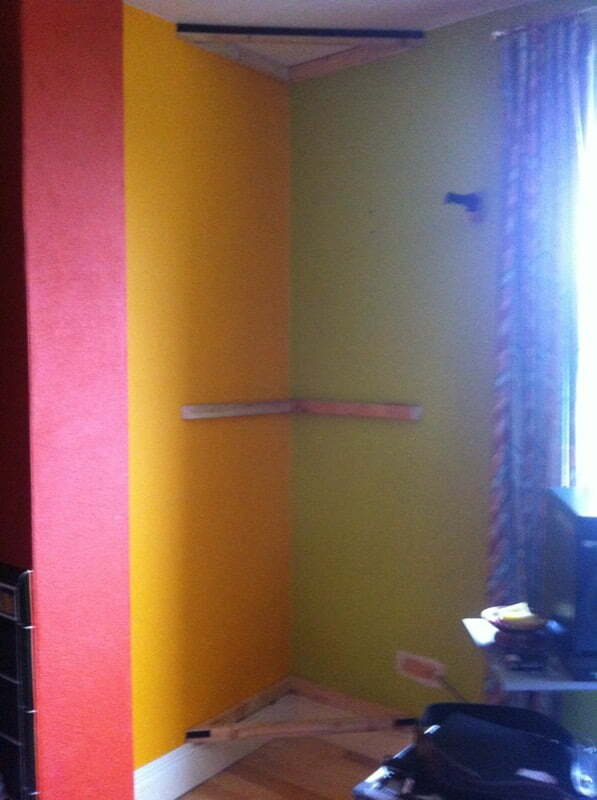 There were two options, remove the skirting completely or create the frame to go around it. As I may move house at some point i decided to go with the latter and created front frames that would be recessed to allow for the skirting while being flush with the wall. (sorry about the bad photo here). I didn’t want any screws or fixings visible on the front of the panels so attached the front panels using heavy-duty velcro. The problem with the heavy-duty velcro as that the adhesive isn’t good enough so I ended up using copydex and some staples to secure it to both the frame and the timbers. I put one strip along the top and two smaller pieces on the bottom. I might add some more in the middle at some point. I stretched the newly dyed fabric over the frames and stapled it to the back then cut away any excess material. Finally the insulation arrived and it was a simple job to cut the triangles and bung it into place. I also filled the area inside the timer frames attached to the walls.